45-Hour Multi-Professional Bartender and Training Certification Experience. 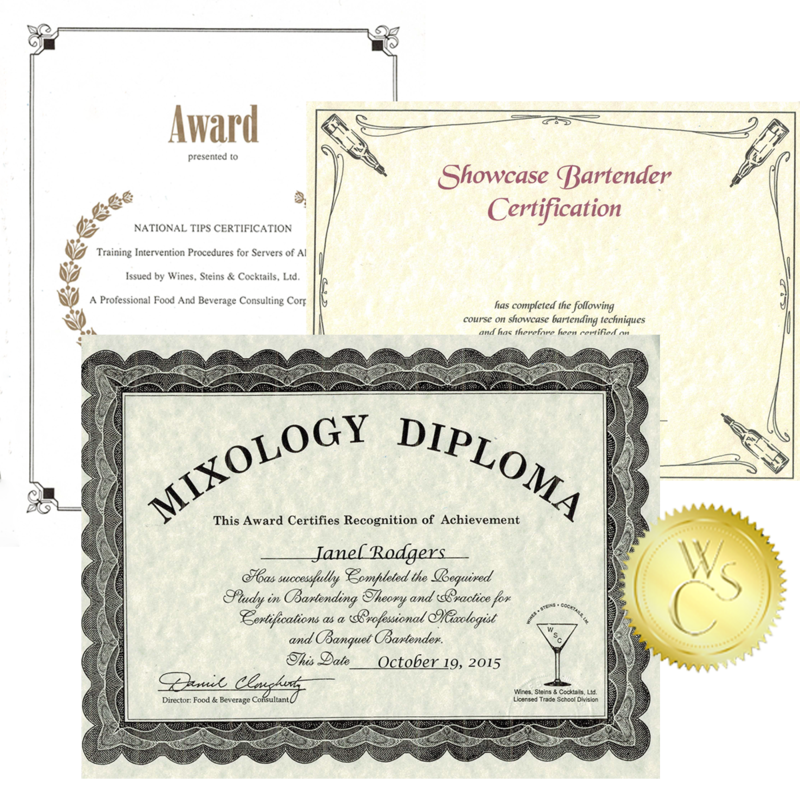 3 Certifications: Professional Bartender-Mixology + TIPS + Showcase Flair-Master Bartender Programs. The Professional Bartender Certification Plus Program provides you with the tools and practical hands-on mixing experience to develop and showcase all your new mixology skills. From standard drink-making to classic cocktails, to flair-bartending and shot-making savvy; you’ll learn everything you need to know to look smart and stand out working any style of bar. In 9 lively and informative training sessions, you’ll acquire both the know-how and 3 valuable Professional Certifications that will give employers even more reasons to hire you. And as always, all of your drink-making techniques are up-to-date, all of your ProTender Cocktail Preparation Manuals are current, and all of your instructors are licensed hospitality professionals with plenty of knowledge to share with you. Check out our full course brochure for more information! Start earning up to $300 per night! Call us today at 1-800-333-7122, Contact Us online, or register and pay online below to sign up! Here’s What You’ll Learn – Hands On Complete! Training Intervention Procedures for the Servers of Alcohol With over 4,000,000 graduates to date, TIPS is the largest and most respected liquor liability prevention program of its kind. You’ll learn legal and effective ways to safely intervene when a patron or guest has had too much to drink, and the precautions to take to prevent such problems before they occur. Whether you work for an establishment or run a bartender service of your own, TIPS will give you the skills needed to reduce the likelihood of lawsuits and liquor violations, and the tools necessary to help lower the insurance costs for employers that want to hire you – a win-win situation. The “Flash that brings in the Cash.” Become a Flair-Master Bartender and double or even triple your tip-making potential!. You’ll learn entirely hands-on: Impressive pouring, glass-stacking, and bottle-maneuvering magic that is guaranteed to astound your friends, dazzle your customers, and fill your tip jar. Upbeat & lively, Flair-Master Bartenders bring “Big City Bartending” to the home-town arena. As seen on television, graduates take home these valuable materials: An illustrated copy of Flair Bartending Made Easy, and America’s #1 Shot-Master Drink Index, complete with over 100 of the most popular Shooters, Tooters, Poppers, Slammers, Bombers, and Mindstoppers selected from Nightclub Hot Spots around the nation. Join the ranks of the Bartending Elite and start making more money today! I am making my registration of $155 to reserve my place in the Professional Bartender Certification Plus Program. Thereafter, I agree to pay $60 at each of the 9 Hands-On Mixology Training Sessions.